It's hard to imagine anyone would argue that Nevada parents are not within their rights to be concerned about the state’s public education system. Nevada has ranked last on education four years in a row in a national survey of child well-being conducted by the Annie E. Casey Foundation. What to do about that sorry outcome, of course, remains a matter of dispute. But some parents are apparently no longer willing to wait for the system to restore itself, and in legislation passed last June Republican lawmakers in Nevada offered them a way to opt-out. The state began one of the nation’s broadest school choice programs this school year, allowing parents to establish educational savings accounts for their children in lieu of attending public school. Account funds may be used for a variety of educational purposes, including private schooling, tutoring or online learning at parents’ discretion and without limitation based on income. Framers of the law believe that the Nevada’s plan circumvents some of the constitutional challenges which have stymied voucher or choice programs elsewhere by disbursing state funds directly to parents, not to schools. That confidence may soon be tested in a state court. “Parents have a right to send their children to religious schools,” Tod Story, executive director of the ACLU of Nevada, said, “but they are not entitled to do so at taxpayers’ expense. The voucher program violates the Nevada Constitution’s robust protections against the use of public funds for religious education. The not-so-little “Blaine amendment,” named for one-time presidential hopeful James Blaine of Maine who introduced it in 1875, was an amendment proposed to the U.S. constitution that similarly proscribed the use of government funds for “sectarian” education. Though he personally had Catholic family connections Blaine had hoped his proposal might raise his profile as a potential presidential candidate by tapping into the rabid anti-Catholic hysteria of his times. He did not succeed in realizing his personal ambitions, but his eponymous amendment in a littler, state-level mutation, did succeed in creating a historic divergence which continues to trouble U.S. education to this day. While many other Western nations have funded or subsidized education regardless of the religious identity of schools without much controversy—and continue to do so—in the United States a more or less dual system evolved, partly propelled by 19th century anti-Catholicism, one system paid for by the state that for decades maintained a Protestant Christian identity and a Catholic school system that rose up in opposition to the cultural and religious flattening intended by the "public" schools. Nevada took the Blaine amendment a step further. Responding to a controversy over the public funding of the Nevada Orphan Asylum, then the largest orphanage in the state, which was operated by the Sisters of Charity in Virginia City, Nevada’s “little Blaine” not only knocked out funding for “sectarian” education, it ordered that "No public funds of any kind or character whatever, State, County or Municipal, shall be used for sectarian purposes." 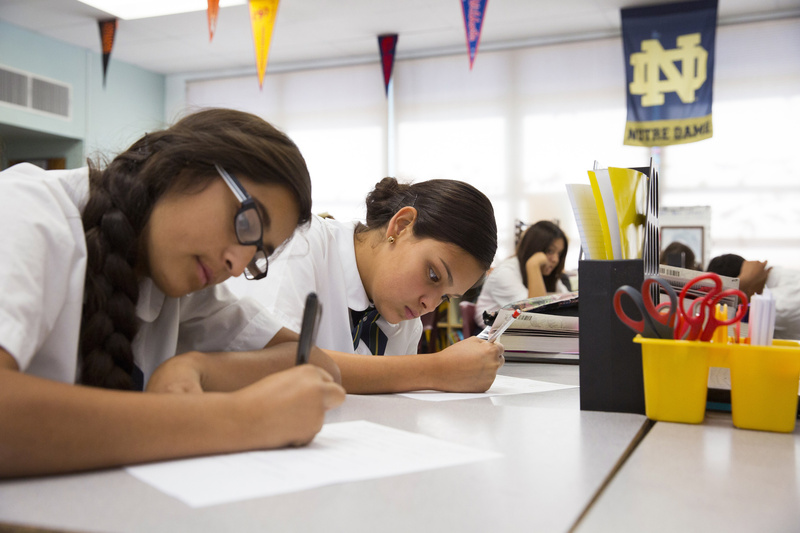 Could the Nevada choice option offer the United States an opportunity to reconsider its 19th century abandonment of Catholic and other independent religious schools? A Nevada court, perhaps ultimately the U.S. Supreme Court, may eventually have to make that call. As a product of k-12 Catholic education, I defend the public school system as the last civic commons in our increasingly privatized, commercially structured society. No money--save that for support services and lunch programs--should be given to religious or private schools. When parents and teachers agree to fund public schools at an acceptable rate, and remain involved in the decisions about staffing and curriculum the record of public schools is very good. If you want to address the fundamental problem with public schools then advocate for the elimination of local public school funding. Does the Nevada law insure a quality education for all the children of Nevada, or just those lucky enough to get into a private school? Do the private schools have to provide counseling for troubled students, students in trouble, handicapped physically or developmentally student? Can private schools boost their standing by kicking out children who don't perform as well? Most important, will this private school program just provide another excuse for not fixing the public schools? Are all Nevada public schools failing. If not, then we know failure is not built into public schools, so make them work. If so, the private schools will have a lot of students to absorb. Public schools have failed tremendously. Private schools do a far better job in educating children given the parents pay for performance. Anything given for free will not be appreciated. I heard it a thousand times as a child from my Latino parents who knew no English, we lived dirt poor and we did not take a dime of welfare: "be educated unlike us" (translated from Spanish). They made it happen. Meanwhile I have surpassed Anglo children of my age group professionally, educationally and have a command of the English language which I lacked as a child, something that White Anglos never let me forget. Today's kids in public schools suffer far worse a malaise than that which is found in few places except the Veterans Hospital Administration, the US Postal Service and US Congress. When something is given for free, performance drops dramatically. Why else do our elected officials in the US Congress do absolutely nothing for a 6 figure income? Because they can. Parents should have the last word on how their children are educated. If they can't/won't do it, then they should pay someone who will. They will find a way to do it - they've got their cell phones, latest electronic gadgets, internet service, TV satellite service, alcohol and truckloads of American toxic food. Two-thirds of the USA is either overweight or obese - and that costs money to get to that point. Pride, Sloth, Gluttony. timeless sins. People will hustle when they want something badly enough. Until parents take an interest in their children, functional/healthy families will continue to be a minority , the government will be seen as the "only way" to resolve personal problems, and America will continue to be a society of entitlements. English is my second language. I learned it in private (Jesuit) schools paid by parents who loved me enough to do whatever it took to provide me what they never had. That is the love of a parent and I owe them everything. Would that other parents do the same today, particularly the White Anglo parents...the majority. "Anything given for free will not be appreciated." This mindset is part of the problem. Public schools aren't "free." We pay for them with our taxes and we vote for local school boards and participate in parent-teacher organizations etc. It's about being a citizen, not a consumer. As for immigrant success in the public schools, I refer you to the generations of Jewish-Americans who came through the public schools (and universities such as CUNY) with great success and civic mindedness.